Phenytoin is available as a 125 mg phenytoin/5 mL oral suspension of opaque orange color with an orange flavor. Phenytoin and other hydantoins are contraindicated in patients who have experienced phenytoin hypersensitivity [see Contraindications (4)].Additionally, consider alternatives to structurally similar drugs such as carboxamides (e.g., carbamazepine), barbiturates, succinimides, and oxazolidinediones (e.g., trimethadione) in these same patients. Similarly, if there is a history of hypersensitivity reactions to these structurally similar drugs in the patient or immediate family members, consider alternatives to phenytoin. Cases of acute hepatotoxicity, including infrequent cases of acute hepatic failure, have been reported with phenytoin. These events may be part of the spectrum of DRESS or may occur in isolation [see Warnings and Precautions (5.4)].Other common manifestations include jaundice, hepatomegaly, elevated serum transaminase levels, leukocytosis, and eosinophilia. The clinical course of acute phenytoin hepatotoxicity ranges from prompt recovery to fatal outcomes. In these patients with acute hepatotoxicity, phenytoin should be immediately discontinued and not readministered. Laboratory Test Abnormality: Phenytoin may decrease serum concentrations of thyroid hormone (T4 and T3), sometimes with an accompanying increase in thyroid-stimulating hormone (TSH), but usually in the absence of clinical hypothyroidism. Phenytoin may also produce lower than normal values for dexamethasone or metyrapone tests. Phenytoin may cause increased serum levels of glucose [see Warnings and Precautions (5.14)],alkaline phosphatase, and gamma glutamyl transpeptidase (GGT). Skin and Appendages: Dermatological manifestations sometimes accompanied by fever have included scarlatiniform or morbilliform rashes. A morbilliform rash (measles-like) is the most common; other types of dermatitis are seen more rarely. Other more serious forms which may be fatal have included bullous, exfoliative or purpuric dermatitis, Stevens-Johnson syndrome, and toxic epidermal necrolysis [see Warnings and Precautions (5.3)].There have also been reports of hypertrichosis. Phenytoin clearance tends to decrease with increasing age [see Clinical Pharmacology (12.3)].Lower or less frequent dosing may be required [see Dosage and Administration (2.7)]. Each 5 mL of the oral suspension contains 125 mg of phenytoin, USP; anhydrous citric acid, carboxymethylcellulose sodium, FD&C yellow no. 6, flavor orange, glycerin, magnesium aluminum silicate, polysorbate 80, purified water, sodium benzoate, and sucrose. NDC 66689-036-50: Case contains 50 unit-dose cups of 4 mL (66689-036-01), packaged in 5 trays of 10 unit-dose cups each. Store at 20° to 25°C (68° to 77°F); excursions permitted between 15° to 30°C (59° to 86°F). [See USP Controlled Room Temperature]. Preserve in a tight container. Protect from light. Do not freeze. Advise patients of the early toxic signs and symptoms of potential hematologic, dermatologic, hypersensitivity, or hepatic reactions. These symptoms may include, but are not limited to, fever, sore throat, rash, ulcers in the mouth, easy bruising, lymphadenopathy, facial swelling, and petechial or purpuric hemorrhage, and in the case of liver reactions, anorexia, nausea/vomiting, or jaundice. Advise the patient that, because these signs and symptoms may signal a serious reaction, that they must report any occurrence immediately to a physician. In addition, advise the patient that these signs and symptoms should be reported even if mild or when occurring after extended use [see Warnings and Precautions (5.3, 5.4,5.5, 5.7,5.8)]. General information about the safe and effective use of phenytoin oral suspension. Medicines are sometimes prescribed for purposes other than those listed in a Medication Guide. 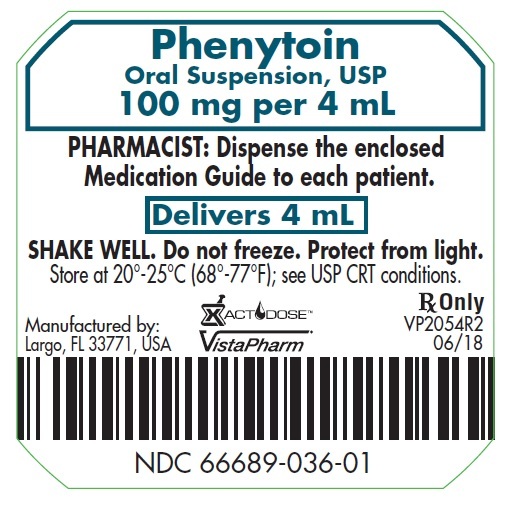 Do not use phenytoin oral suspension for a condition for which it was not prescribed. Do not give phenytoin oral suspension to other people, even if they have the same symptoms that you have. It may harm them. You can ask your pharmacist or healthcare provider for information about phenytoin oral suspension that is written for health professionals. Inactive ingredients: anhydrous citric acid, carboxymethylcellulose sodium, FD&C yellow no. 6, flavor orange, glycerin, magnesium aluminum silicate, polysorbate 80, purified water, sodium benzoate, and sucrose. For more information, call VistaPharm, Inc. at 1-888-655-1505.